SAAT 2019 Application Form: Siksha ‘O’ Anusandhan University (SOA) is a private deemed to be university accredited by National Assessment and Accreditation Council (NAAC). This university offers various undergraduate programs in Agriculture, Business Administration, Biotechnology, Dental and Medical Sciences, Engineering, Nursing, Pharmaceutical Sciences, Hospitality Management, Hospital Administration and Law. All eligible & interested candidates can apply through the SAAT Registration Form for appearing in the SAAT 2019 Examination. The application form will commence in the month of December. Candidates have to register for the application form to get admission into SAAT and submit it before the last date. 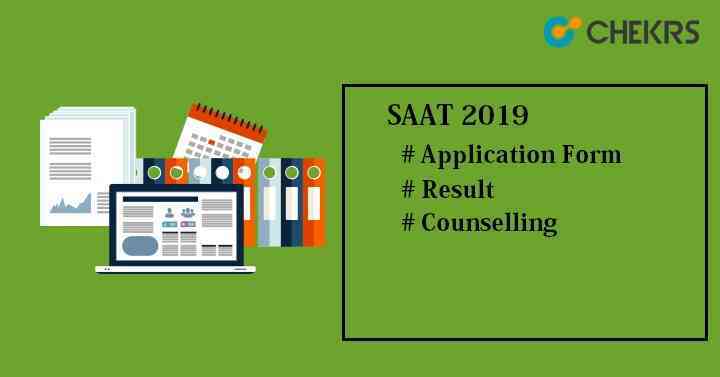 SAAT 2019 Application Form Dates are not decided yet. Here we have mentioned the expected dates related to the SAAT Admission. We will update the official dates after issuing of official notification on the university official portal. Check the given dates and be prepared accordingly. SAAT Eligibility Criteria will be set by the SOA university official authority. It will be different as per the courses applied. Candidates must follow the criteria prescribed by the university. Otherwise, their application form will be canceled and candidates will not be considered for the SAAT Exam 2019. Must have passed 10+2 or equivalent exam with Physics & Mathematics as compulsory subjects with at least 45% marks (40% for SC/ST/OBC category). Candidates can also get direct admission through valid JEE Mains score card. Applicants must have passed 12th with PCB/PCMB & PCM and English as necessary subjects with minimum 45% marks in aggregate. Final year candidates can also apply for SAAT 2019. M.Tech Should have passing certification in B.Tech/B.E./AMIE/MCA/M.Sc or any equivalent exam with at least 50% aggregate marks (45% for reserved categories). MBA/MHMCT/MHA/MHTM Aspirants should have graduation degree with at least 50% marks (45% for SC/ST/OBC category). MCA Should have 3 years bachelor degree in any stream and have mathematics as subjects in 10+2 or graduation with at least 50% aggregate (45% SC/ST/OBC category). All eligible & interested candidates can apply for the SAAT 2019 Application Form through online mode only. The application form will commence in the month of December. Candidates have to register for the application form to get admission into SAAT and submit it before the last date. Go to the Notification at the bottom of the page. In SAAT Admission notification, select the course for which you want to apply. Fill the SAAT Application Form with the basic details like name, father’s name, mail id, mobile no etc & select center and then submit it. An OTP will be sent to your registered mobile no. Verify the code by entering the verification code on the registration form page and then click on “Create New Account”. User ID and password will be generated and send to your mail id. Log in to your account with the generated user id and password. Upload scanned copy of Photo and Signature (Size: Less than 1 MB, Format: Passport Size, Type: png gif jpg jpeg). Click on “Undertaking” button to agree on declaration message. There will be no application fee or SAAT Admission Form Fee. So Intrested and eligible candidates can apply for the Examination.